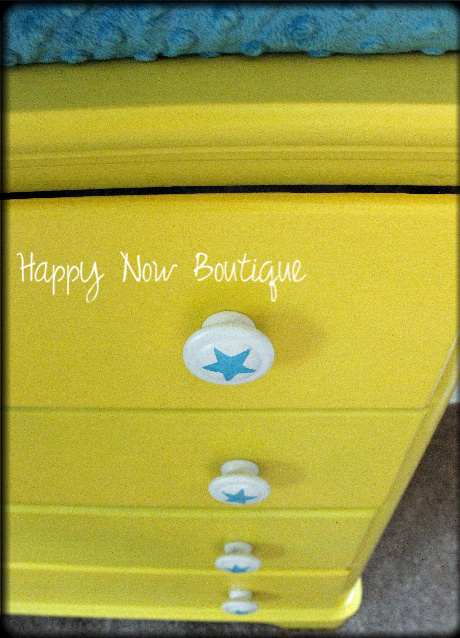 Today's post features a project that Happy Now recently completed for one of our clients. The client in question is expecting her second child, a boy, this October. She and her husband already have a beautiful little girl, so as they decided on a style and theme for their new baby's nursery, she knew she wanted a change in color and direction. 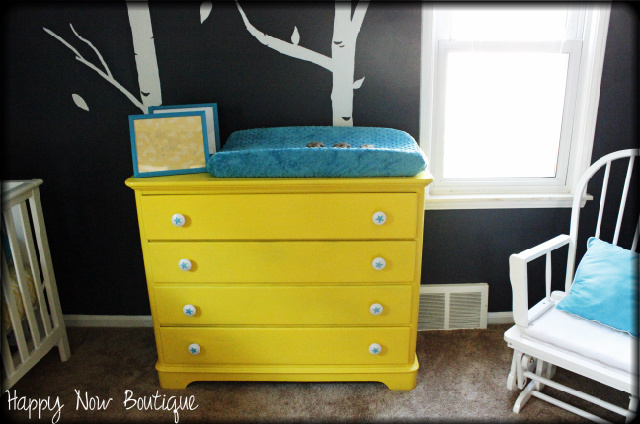 And she also knew she wanted to incorporate a gorgeous, hand-me-down dresser, given to her by her grandfather, for whom her sweet baby boy will be named come October. 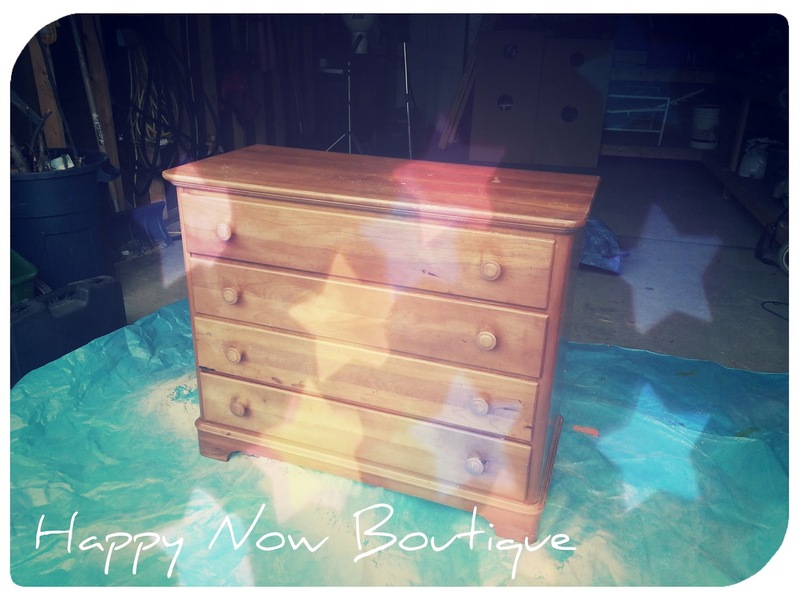 This dresser is huge, with deep drawers and a ton of storage space. 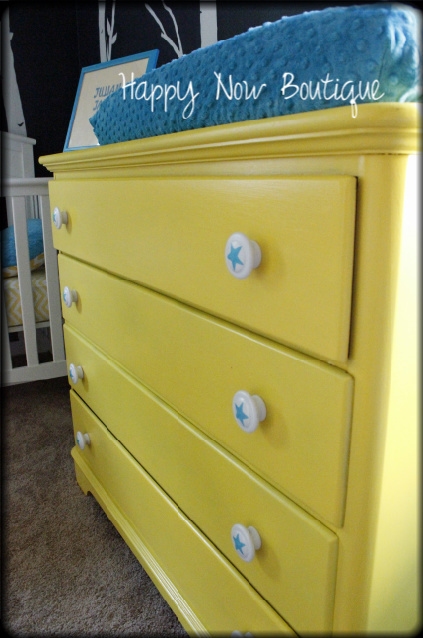 Perfect for a changing table! 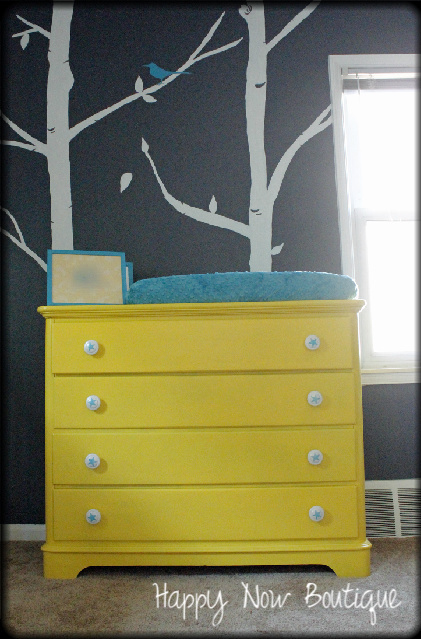 My client had settled on gray and yellow as her nursery theme colors, and wanted the dresser to be painted yellow. 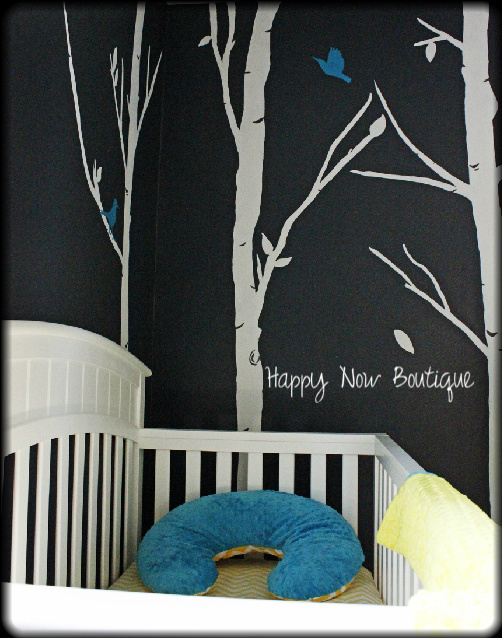 The walls of the nursery were painted in a dark shade of gray and a beautiful, hand-painted, tree wall mural was added after. 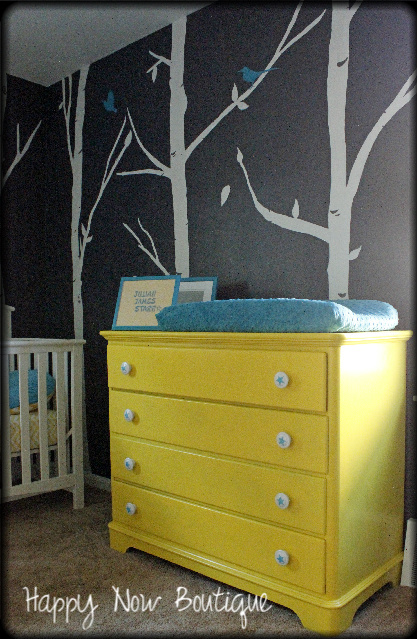 She also wanted to incorporate her family's unique last name into the changing table design, using stars. Once I helped her decide on the perfect shade of yellow, we got to work. The dresser hardware was removed and the entire piece was sanded using a high grit. I primed the piece with a Rustoleum spray primer and used two coats of a sunny yellow from Behr, which, coincidentally, was named Bright Star. Perfect? I think so! 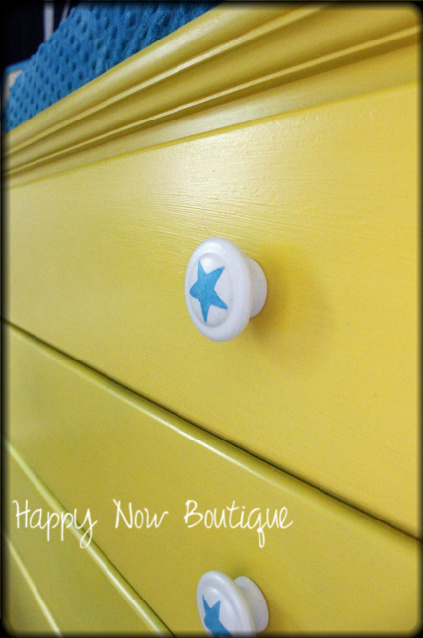 In order to satisfy her desire for star accent pieces, I suggested we hand paint the knobs to look ceramic, and use a star stencil detail for each knob. She loved the idea and each accent star was painted in a beautiful teal to match the pretty, hand-painted birds on the nursery wall. Lets take a look at the amazing results!!! Here are a few more pics showcasing the incredibly unique vision my client had for this nursery. Everything was done by a family member, whether it be painting the room, adding the wall mural, or designing accent pieces and decor. This was truly a labor of love, and a very cost-effective way to achieve a dream space. The gorgeous wall mural with teal bird accents. The rocker in the background was used for my client's first baby. She re-painted it white and had a family member sew fabric slip-covers to cover the old cushions, not yet pictured. 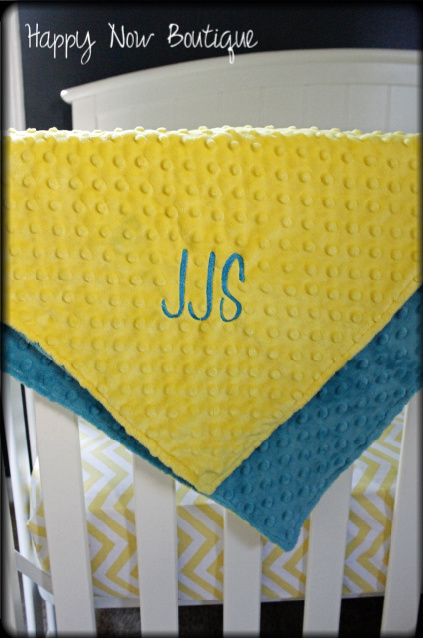 This personalized baby blanket was ordered via Etsy at an affordable price. It's the small touches that really make a huge impact. 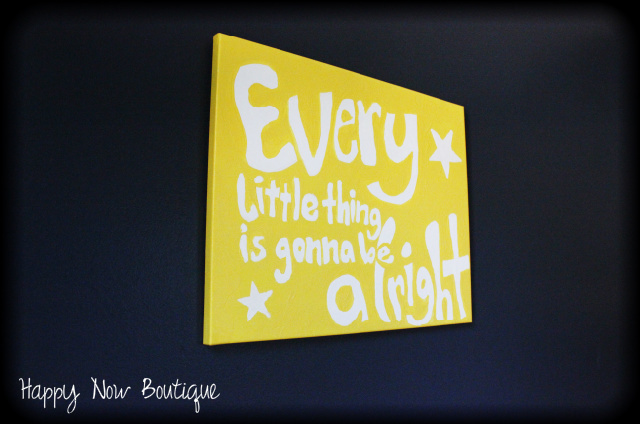 A hand-painted canvas designed and executed by my client and her husband. 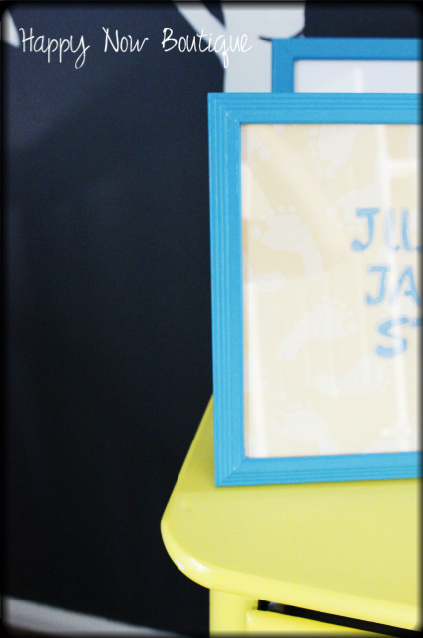 Hand-painted, dollar store frames filled with scrapbook paper and stencil designs. 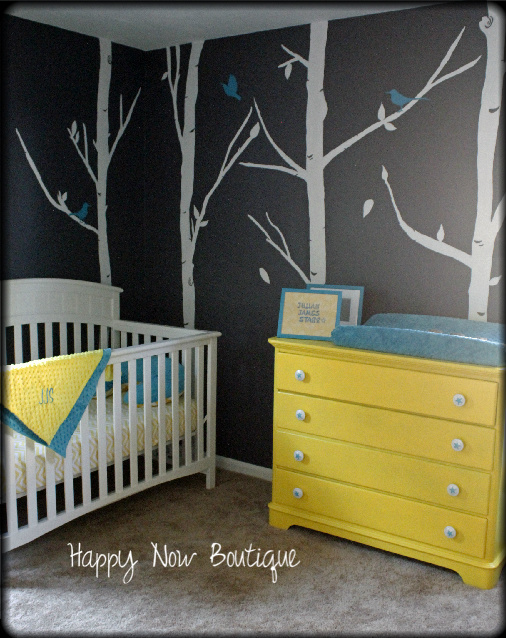 Affordable, custom art for baby! This project was truly a labor of love for my clients. They thoughtfully chose the look and feel of the space and were very much involved in the entire process, which brings forth such comfort and peace to the completed room. 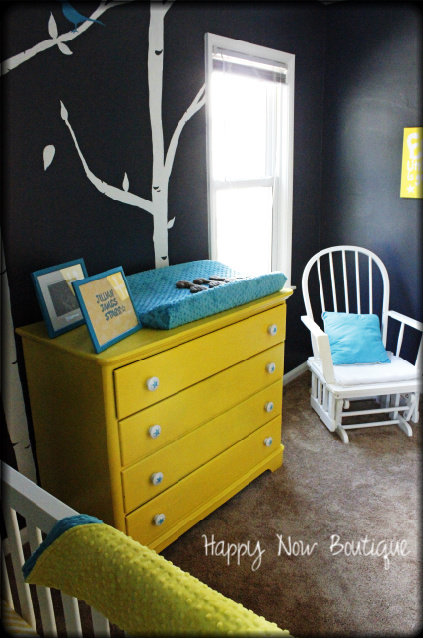 Baby boy will be so lucky to sleep in this nursery! that unknown is Melissa, Auntie to that new baby boy we're waiting for! FANTASTIC job Shannon! Thank you Melissa! This project was so much fun and the family was a dream to work with! Definitely up there as one of my favorites!